To kick off our Artisan Spotlight series, our little way of showcasing the many talented makers & artists that help bring our designs to life, we are absolutely thrilled to introduce you to the multi-talented and brilliant Sean McClelland of Nafco Studio. This profile is a snippet of his story and how it came to be, told in his own words. There is no truer way to capture the passion & emotion that projects into these pieces like the artists hands & words. We hope you enjoy learning about our makers as much as we enjoy working with them! Tell us a little bit about yourself? Where are you from? How’d you get started in your trade? I was born in Northern California but moved to Washington state when I was young. I was raised in the capital, Olympia, which is a very liberal college town. Back then it had a thriving punk rock music scene and this greatly contributed to my exposure to the arts and everything that went with them. After school I would hang out at the local book stores and pour through materials on painting, architecture and eventually interior design. Magazines like Wallpaper and NEST were hugely influential on my young mind and discovering them was invaluable to my introduction into that world. My very first email address was actually through Wallpaper magazine - how nerdy is that?! I always thought that I was going to be a painter, though, and in high school I rented a basement in a local guy's house and turned it into my studio. I would spend hours there drawing, painting, and getting drunk on the beer I stole from the local supermarket. Eventually I discovered furniture and came across an article about BDDW. I was hooked. Years later I would be lucky enough to meet the owner of that company, Tyler Hayes, and even worked for them for a short period. Moving to New York when I was 20 was the best thing I ever could have done to perpetuate my exposure to the furniture world and guide my steps to where I am today. The people I have met and the shops I have worked in have all contributed to the trajectory of my career and my taste in design. I didn't go to school for this and it's been a long and difficult road. That said, I wouldn't change any of it and quite honestly I believe that my alternative education was formative to my personal and creative development. I usually get up around 6/6:30 and make coffee. I then get back into bed with my girl and our dogs and look through a series of websites and blogs that keep me informed about what's going on in the design world. I need to start my days with as much visual inspiration as possible to help get me energized for the day. Depending on what's going on, I either head to the shop to work on current projects or I sit down in my office to answer emails or to work on drawings. I recently moved to a small town upstate called Newburgh, and the freedom to move around is invaluable to me. I try to work with as many local suppliers, vendors and contractors as possible, and being able to drive through the beautiful country instead of the congested streets of Brooklyn and Manhattan to get to them is so much better for my creative process. Being up here has allowed me to take care of my professional life as well as my personal life. Frequently in the summertime I'll drop what I'm doing and take the dogs on a small hike or down to the river. I love being able to break up my days like that. When it's quitting time I'll go pick up my girlfriend from her studio and we'll go grab a drink at the local yacht club-type bar and watch the trains go by on the other side of the river. It's kinda perfect. What helps you find inspiration? I'm always inspired by other designers and builders. The whole industry has seen a bit of a boom in the past 10 years or so with many young people starting companies and taking things into their own hands. I hate the term DIY but in essence that's what has been going on though on a much more professional level. I love watching seemingly small businesses and designers dictate the way trends change and influence the way the world looks at industrial and product design. History has always influenced the way I see and do things as well. I worked in antiques for a while and seeing what has come before you is hugely important for being aware of your position in the timeline of design. I also glean so much from architecture. We're surrounded by numerous historically significant buildings up here, which are probably my number one influence right now. Those, and the way architecture juxtaposes itself into nature have a big affect on me. Nothing pleases me more than to see a modern concrete structure right in the middle of a large green field or at the end of a long country road surrounded by trees. Where is your studio located and where do you source your materials from? My studio is in Newburgh, NY. It's an hour and a half up the Palisades right on the Hudson River. It's a fantastic place to live and work due to its proximity to the city as well as its closeness to all the other Hudson Valley makers. Everyday I feel lucky to walk out my front door and get to see whatever the river has decided to do that day. So far, I've been lucky to be able to source all my materials locally. By locally I mean the whole Hudson Valley. Driving an hour or so to pick up lumber is not unusual, nor is it a burden. I love seeing new things up here and meeting new people in all the small towns. The first thing that struck me about our new town was the sense of pride and community that everyone has. That seems to be a common theme in most places I've encountered up here. What's your favorite thing about collaborating with designers and how has that helped you grow? Collaboration is key to keeping things fresh. I'm definitely a control freak, but that's just in an attempt to keep quality and aesthetic value up. Learning to let go and hear what other people have to say is essential to maintaining your own sanity as well as the success of any business. No one can do it all themselves. Humble yourself and find out what good things can come from it. I also have no qualms admitting that someone else might be better at something than I am. Everyone has their specialty and finding those that compliment and elevate what I do is hugely satisfying as well as educational. One of my main intentions is to perpetuate other people's businesses through mine. I don't have any employees at the moment, I just hire friends and other craftspeople when I need them. This way everyone stays in control of their own time while working together to create a beautiful piece of furniture. What does sustainable design mean to you and how do you implement them into your creations? 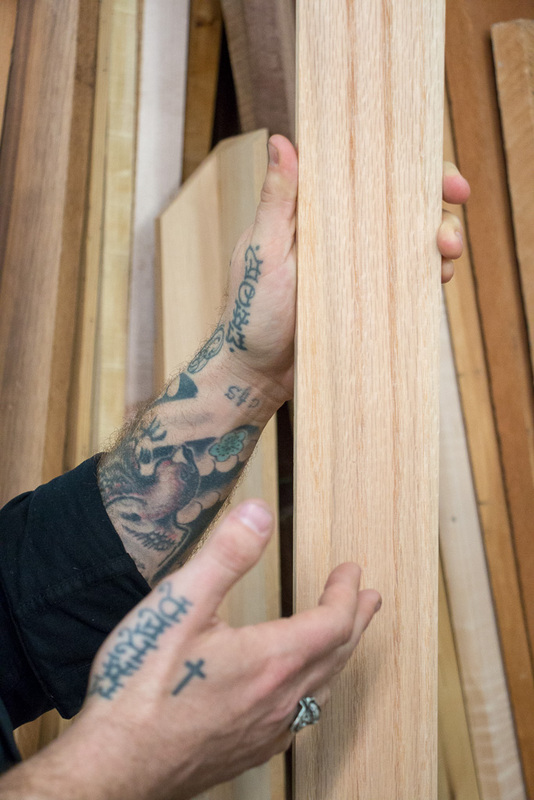 When most people hear the words "sustainable design," they think of reclaimed wood and the up-cycling trend that seems to still be plaguing the industry. I should say that I don't have anything against reclaimed wood - that's how I got my start, and to this day, I still find the material extremely beautiful. The problem is that sustainability involves so much more than old wood and factory parts. In fact I believe the most sustainable design is conscious of this and actively tries to stay away from what the masses may deem valuable at a specific time. By focusing your efforts on building pieces that will last and have a timeless quality to them, you are already a step ahead of any current movement or trend. Trends are the opposite of sustainable. I believe a sort of "New Traditional" aesthetic has infiltrated interior and furniture design. I do my best to function within the parameters set for myself concerning that aesthetic and seek to build pieces that are interesting and progressive from a material standpoint. Doing this not only produces what I consider a sustainable piece of furniture but also ensures security among the trades. If I work with artists and craftspeople that adhere to a similar philosophy then I am also perpetuating commerce and well being.